Diana and I lost a good friend of ours over the summer. I haven't been able to really process it yet. Don was a great friend and a great guy who had so much strength.... 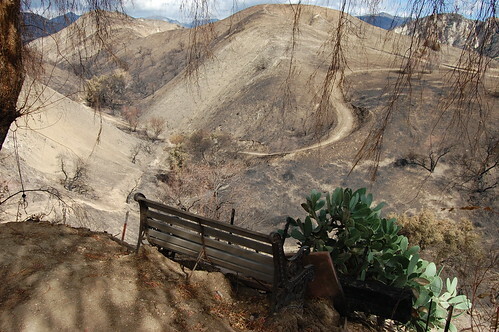 This is a picture of the bench behind Jan and Don's old home in Kagel Canyon after the big fire in November. Jan came back into town and we checked out the property together. The fire raged all over the place, cooking their back yard, all except for the bench at which he had spent a lot of time looking out over the canyon. I logged some bench time with him there too. That's it I guess...if I can grasp any metaphor to attempt to encompass everything that has happened recently, I guess it would be this one. I just would like to sit at that bench again someday. 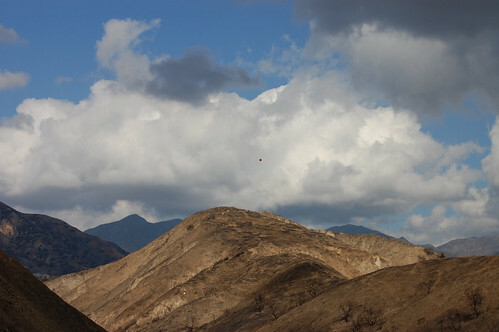 One more for the road...check out the pic in large size on the Flickr page to see the red balloon floating off. Posted by snaggle on Tuesday, December 30, 2008, at 2:24 pm. Filed under 86. Tagged memorial, rant. Follow any responses to this post with its comments RSS feed. You can post a comment, but trackbacks are closed.